A wandering bear went inside a car parked in Lake Tahoe, Carnelian Bay in California this week looking for some adventure. What a misadventure it turned out to be as the animal trapped itself inside the vehicle and could not get out. The doors could not be unlocked even from the outside that it took the daring moves of a deputy to free the bear. The bear destroyed the car’s interior so badly that the doors of the Subaru Outback could not be unlocked anymore. 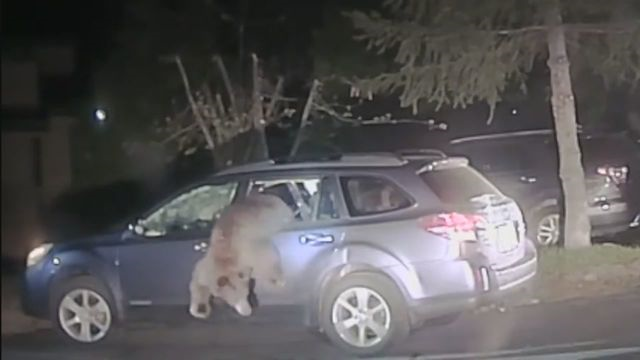 Placer County Sheriff’s Office Deputy Lade decided that the only way he could free the bear was to break the car window. After smashing the vehicle window, the bear found the opening to jump out from the imprisonment it caused itself and ran for freedom deep into the forest. It took bravery for the deputy to do what he did, be that close to the bear, even if it was trapped inside. There was no assurance he won’t be attacked after helping free the animal. The video of the rescue was taken by the deputy’s dash camera. that's a good and brake cop. I just wanna know how he got locked inside? The only plausible way I can see is if the owner had food inside the car with the door open and just by chance after a bear crawled inside, the wind blew the door shut.!? i'll bet the hatch was open and closed after him.